I wanted to write about storyboarding for tonight’s entry since I’ve had some success with it. But while researching it, I came across this. Remember this from elementary school? 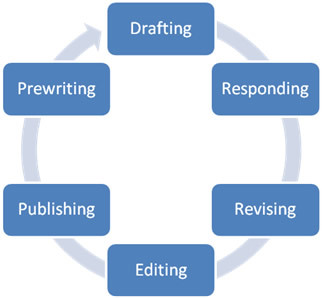 These are steps we were all taught about the writing process -prewriting, drafting, revising, editing, publishing. They seemed simple enough, right? Four easy step to perfect prose. Not so fast. It’s a bit more complicated than that. Prewriting is what I like to call procrastination. That’s when the house gets vacuumed, or the dishes are washed. Hours of Psych episodes are watched and thoughts are tossed around like footballs inside my head. After procrastination is, you guess it, MORE procrastination. More cleaning and cooking but this time there is some discussion with friends, some Internet research. That is followed by drafting. Finally my computer is dusted off and words are tapped on its keys. I’ll write and write and … I’ll hate it. Then I’ll walk away, start another project because a SUPER awesome idea just popped into my head and that’s what I want to do. So that idea goes through the procrastination phase until, my current story takes a twist. Like magic it’s done. Well more like shear dumb luck. Revision consists of my reading it out loud to my cat who could care less that people are killing each other or sleeping with the mayor. She’s rather lick herself. But I don’t take it personally because her not licking herself means she’s walking away and at least this way I have her attention. I’ll go through it again, sans cat, questioning whether things are believable or whether a character would react differently. Of course, they would have reacted the opposite of what I wrote, which means I’ll have to write that scene again. And that throws off the other scenes to, so guess what? I have to do a complete rewrite. My editing phase is next and I read over it to catch the grammar mistakes because THERE ARE ALWAYS GRAMMAR MISTAKES. Is it in the right tense? Are there comma where there are suppose to be and not where they are NOT suppose to be. Pronouns match the nouns? Subject verb agreement? And even after the several re-writes and the grammar check, it’s gotta go through the critique group. That’s almost like publishing but not really. Dear Lord, that’s a whole other system. They’ll all read it then discuss it when it comes up in the rotation. A long distant phone call is involved and they tell me how much they love me but that my story needs work…lots more work. So I take their suggestions, not all but some, and I fiddle with it again. But I have to go through the entire process again, procrastination, more procrastination, drafting, break, drafting, revision, doubt, lame grammar check and then another round with the group…. What I’m really trying to say is that the writing process is more than four steps and the American education system should stop lying to children. LOl. That's so funny Okibum! I remember a post like than in my classroom growing up and that it was pretty. But when I started writing, it was nothing like a poster. I was so mad. LOL!